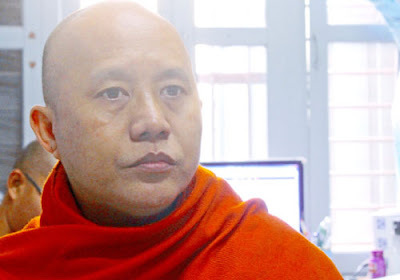 The National League for Democracy has condemned nationalist monk U Wirathu for posting a video on social media seen to be inciting inter-communal violence. In response to messages by readers condemning the video as hate speech, Facebook took down the post on Monday night but only after it had been widely seen and distributed for three days. Facebook told readers the post had “violated our Community Standards”. The six-minute video, called The Black Day, depicts a Buddhist woman being raped and killed by three men in gruesome detail. A narrator explains that this is a reenactment of the murder of Ma Thida Htwe in Rakhine State in 2012 by kalar – a derogatory term used to refer to South Asians and especially Muslims. Her killing, magnified by reports and rumours, led to a revenge attack on Muslims and triggered widespread violence across Rakhine state, resulting in at least 167 deaths and the displacement of over 140,000 people, according to the government. The two communities have remained segregated since then. U Wirathu, who has a wide following and had been jailed by the former military junta for inciting religious hatred, told The Myanmar Times that the clip was a trailer for a longer video he plans to release after the NLD assumes office. He said he had not posted the video earlier so as to avoid fueling tensions during the elections last year and the current transition period. "I want to show the NLD government that it needs to prioritise protecting the race and religion of the country," the 47-year-old Mandalay monk said. Senior NLD official and party spokesperson U Win Htein condemned U Wirathu for his action, accusing him of trying to stir up trouble in the country. "I really want to ask to U Wirithu if he is a real Buddhist monk or if he is making trouble in the community due to poor morals,” U Win Htein told The Myanmar Times. U Win Htein recalled attacks on the NLD during the election campaign last year by Ma Ba Tha, the nationalist Buddhist organisation, some of whose members, including U Wirathu, campaigned for the military-backed Union Solidarity and Development Party. "It would be ridiculous if we were afraid of such a threat [by U Wirathu]," U Win Htein said. Minister of Information U Ye Htut declined to comment on the video which he said was the responsibility of the Ministry of Religious Affairs. "I got information from Facebook about someone commenting on the video so the Ministry of Information will remind the Ministry of Religious Affairs to handle the case,” he said. U Wirathu, who has long been involved with the anti-Muslim 969 movement and denies inciting violence, confirmed that he posted the video on January 30. By the time it had been removed by Facebook, it had attracted nearly 120,000 views and shared over 8000 times. U Wirathu told The Myanmar Times last November that he had admired Daw Aung San Suu Kyi when she was a political prisoner fighting for democracy. But he turned against her and the party for its opposition in parliament to four “race and religion” laws promoted by Ma Ba Tha that set out to regulate matters of interfaith marriage, population control and monogamy. Ma Ba Tha and activists like U Wirathu were seen last year as potentially influencing the outcome of the elections to such an extent that the NLD decided not to field a single Muslim candidate. In 2013 inter-communal violence spread to the town of Meiktila and other parts of central Myanmar, claiming dozens of lives. The UN Special Rapporteur for Human Rights at the time urged U Thein Sein’s government to take immediate action to stop the violence, saying it should act against “campaigns of discrimination and hate speech which are fuelling racist and, in particular, anti-Muslim feeling in the country”. In June 2014 a false report spread on social media that a Buddhist woman had been raped by Muslim men triggered violence in Mandalay. Two people were killed. U Kyaw Min Swe, chief editor of the Voice newspaper, criticised the government for jailing NLD supporters and activists who had satirised the military on Facebook, but then refusing to take action against nationalist groups spreading hate speech on social media. “In this time of transition the government should be working to foster improvement and no one should be making such insults,” he said.